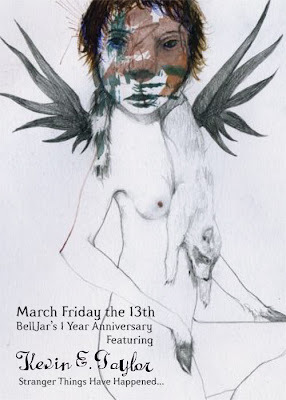 BellJar will be hosting a special Darkly Romantic Friday the 13th 1 year anniversary party. Have your photo captured by our special eccentric Victorian photographer and be styled by our in house specialist. Enjoy 10% off all stores merchandise. Wear a gorgeous little ensemble with a spooky or romantic theme and receive 20% off. Gallery Belljar will be featuring the work of Kevin E. Taylor. Kevin was born December 28, 1972 in Charleston, SC. In 1995, he received a B.F.A. from The Savannah College of Art and Design. His work has been exhibited throughout the US, as well as internationally. Though primarily an oil painter, he also explores time based art forms such as sound and video. Kevin lives in San Francisco, CA. I attempt to expose the animal within. Much of that which is assumed to be chaotic and incomprehensible within the human paradigm can be clarified through the observation that we, like all organisms are bound first and foremost by natural law. Over time, civil responsibility has ordered a physical detachment from nature, however a deeper mental architecture remains intact. It is this power play with which we struggle internally. I take interest in formulating a parody, amplifying an analysis, and offering visual depiction of this all at once grotesque, lovely, and hilarious production.